Chronic pancreatitis is different from acute pancreatitis in that the inflammation and damage develop more slowly, and can become increasingly bad over time. The pancreas becomes scarred and loses its ability to make enough digestive enzymes and insulin. Thickening of the pancreatic juices may result in clogging of the pancreatic ducts and pancreatic stones which, along with damage to the ducts themselves can result in aggravation of the pancreatitis due to obstruction. When chronic pancreatitis occurs in many members of the family, sometimes starting with childhood attacks, it is called familial pancreatitis. A similar form of chronic pancreatitis occurs in tropical countries, often associated with severe malnutrition. Most patients with chronic pancreatitis have pain in the upper abdomen, which may also be felt in the back. This can be very severe and continuous, but is more often intermittent, and occurs in attacks, which are usually not sufficiently severe to require immediate treatment in hospital. A few patients with chronic pancreatitis never have pain. Lack of enzymes due to pancreatic damage results in poor digestion and absorption of food, especially fats. Thus, weight loss is characteristic of chronic pancreatitis. Patients may notice bulky smelly bowel movements due to too much fat (steatorrhea). Occasionally, an "oil slick" can be seen on the toilet water. Swelling and scarring of the pancreas may damage other local structures. If the bile duct is narrowed, the patient may develop jaundice. Inflammation of the large vein (splenic vein) behind the pancreas may cause increased pressure in veins elsewhere, and the development of varices in the upper stomach and lower esophagus; these can burst and cause severe bleeding. Patients with chronic pancreatitis carry a slightly increased risk of developing pancreatic cancer. 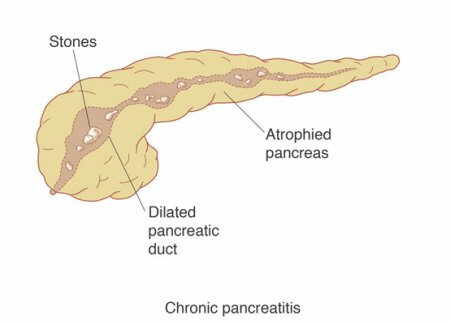 The diagnosis of chronic pancreatitis is obvious in an advanced case with typical features: upper abdominal pains with weight loss; steatorrhea; and, diabetes. However, all of these features are seen only when the disease has been present for many years. Most patients present with pain only. Similar pains can be caused by cancer of the pancreas (although this is not usually intermittent), gallstones and bile duct stones, or severe types of gastric or duodenal ulcers. All of these conditions have to be considered and appropriate diagnostic tests applied. Endoscopic ultrasound is a technique used to detect subtle and early changes of chronic pancreatitis while ERCP is widely used in the evaluation and management of patients with known or suspected chronic pancreatitis. Chronic pancreatitis can be confirmed by X-ray tests, ultrasonography, CT scans, and MRCP. - replacement (by mouth) of missing digestive enzymes. Patients are normally advised to maintain a diet low in fat (less than 40 gm per day) when steatorrhea is present. Pancreatic enzyme supplements need to be taken in high dosage and with meals (often with medicines to reduce gastric acid). These help to digest fat, and may also sometimes reduce the amount of pain. Pain control can be a challenge in patients with severe longstanding chronic pancreatitis. Narcotic addiction is a risk. It is possible to block the nerves which come from the pancreas by injection treatments (celiac plexus block). However, the effect rarely lasts more than a few months. Surgical treatment may be helpful in certain circumstances, particularly to relieve obstruction to the pancreatic duct or bile duct, or to remove damaged or poorly drained pancreatic tissue. The most common operations are the Puestow and Whipple procedures, or a distal pancreatectomy. (Rarely would it be required to remove the entire pancreas.) Some patients with chronic pancreatitis have pseudocysts, which sometimes requires surgical drainage. ERCP techniques have limited application in the treatment of patients with chronic pancreatitis, although sometimes ERCP is helpful to improve pancreatic drainage via the removal of stones or placement of stents. This can help also when there is leakage of pancreatic fluids (pancreatic fistulas).